Live shots are not supposed to end with shots fired. Wednesday morning's murder of two journalists on live television has caused heartache and anxiety in newsrooms across the country. It has also caused a difficult reassessment of the security concerns surrounding a staple of TV news: live reports from remote locations. While there wasn't a widespread pullback in live shots, and experts say there won't be, there were anecdotal reports of stations electing to halt or limit them for a few days. Alison Parker and Adam Ward were broadcasting live on WDBJ, the CBS affiliate in Roanoke, Virginia, when ex-colleague Vester Flanagan shot and killed them. Notwithstanding a "news must go on" mentality, some TV newsrooms were deeply shaken by the attack because there was a sense that it could have happened to any news crew. "As I head out the door to my 10:00 liveshot, I can put myself in Alison's shoes," Alexis Zotos, a reporter on KMOV in St. Louis, blogged the night of the shooting. Zotos and other journalists described a sense of uneasiness in the wake of the attack, which many of them had to cover. In several markets, including Boston and Indianapolis, officers even stopped by TV newsrooms. "Thank you," WTHR news director Kathy Hostetter tweeted to the Indianapolis police for visiting "to offer support" on Wednesday. "It meant a lot to all of us on a very difficult day." Thank you . @IMPD_News for visiting our newsroom today to offer support. It meant a lot to all of us on a very difficult day. In Polk County, Florida, Sheriff Grady Judd offered to provide deputies to accompany journalists on live shots, even if the journalists were covering his department. "In 40 years I can't recall a police chief or sheriff ever saying something quite like that," veteran TV reporter Dave Statter said in an email. To be sure, instances of workplace violence have haunted other professions. Some viewers have suggested that there has been excessive media coverage of the WDBJ killings, given the grim daily death toll from guns in the United States. Moreover, safety concerns are nothing new for TV crews. Criminals have interrupted live shots, confronted reporters and stolen their equipment in the past. Journalists do sometimes take precautions on risky assignments and, in rare instances like riots, security personnel do accompany crews. But analysts could not recall the explicit broadcast of murders in the United States before. "It's clear the killer was intentionally using live programming as a platform -- and live shots are inherently less controlled environments," said Jeff Halliday, a TV sports anchor and reporter turned professor in Virginia. He said the shooting had affected the "psyche" of reporters this week by reminding them how exposed they are. The lights, camera and oftentimes a boxy transmission truck all contribute to a feeling of vulnerability. "I have been her, hundreds of times in 23 years, ignoring the person I see walking up out of the corner of my eye. I cannot look at or be distracted by the passersby, the lookie loos or the rabble rousers, because I am on live television. But I see you. And I hope that you let me finish my live report before you do whatever it is you've walked up to do." Crews sometimes have a truck operator, someone who transmits the live pictures and doubles as a spotter. WGN Chicago reporter Randi Belisomo recalled many times when the operator has "run interference" and even shoved people out of the way when necessary. But with newsrooms "saving money, cutting staff and doing more with less, the third crew member is becoming rarer and rarer," she said. Some reporters even broadcast live by themselves without a photojournalist. Matt Blanchette, a TV reporter for a decade who changed careers last month, called this a "troubling trend." "I would watch former colleagues do door knocks on criminals' homes alone, then be asked to go out live in the area of a shooting, alone," he said. As a practical matter, enhanced security during run-of-the-mill live reports is unlikely. Statter, who covered crime and other stories in the Washington area for decades, said it is "not realistic at all." Global Post CEO Phil Balboni told The Boston Herald that "it's impractical to be able to do it without a radical change in the way news stations operate." 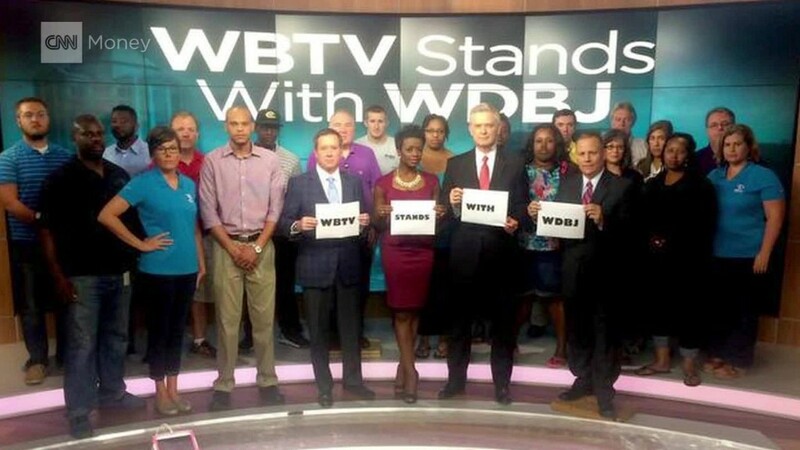 In the short term, local officials in Roanoke offered security assistance to WDBJ. On Friday night the station resumed live shots, starting with a Friday night football game. Two officers were standing nearby. After the live shot, onlookers hugged the reporter, and as she wiped away tears, she said "We did it." On CNN's "Reliable Sources," the station's general manager Jeff Marks told me that WDBJ's news director Kelly Zuber is making case-by-case decisions for live shots in the wake of the shooting. "The plan going forward is to look at each live opportunity separately and make the proper decisions," he said. "I think it's best if we keep our plans to ourselves," he added. "But it's certainly a subject of discussion here, and I can imagine every newsroom in the country that routinely does these... live reports from the field."